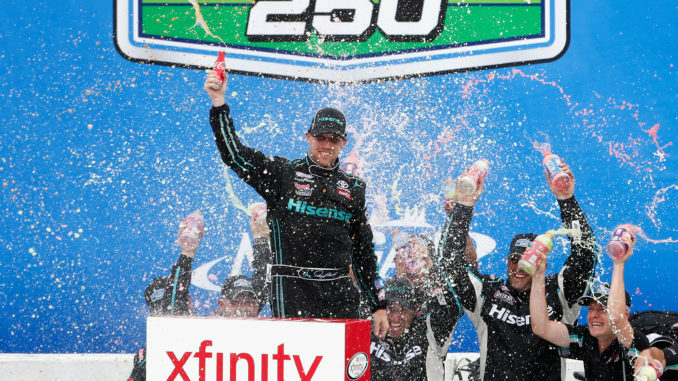 Denny Hamlin on the final lap was able to pass William Byron coming to the checkered flag to secure his first victory of the 2017 NASCAR XFINITY Series season in the closest finish ever at Michigan International Speedway. Kyle Busch secured the pole with Brad Keselowski starting second. Coming to the green flag both drivers started but Busch threw a block on Keselowski entering the first turn, and got clipped by the No. 22 sending Busch swerving into outside wall. The No. 18 then spun down into the infield, narrowly avoiding the inside wall. The damage to the right rear quarter panel would prove to be a hindrance to Busch all afternoon as he fought his way back to the front.. The green flag came back out at Lap 6 with Keselowski leading them to green and Byron sitting in second. Keselowski blasted off with the lead, and wouldn’t look back as the caution came out at the end of Stage 1 with Keselowski securing the No. 22 its sixth stage win of the season. Despite the first stage having that single caution at the beginning, the rest would be caution free. Byron, Tyler Reddick, Spencer Gallagher, Cole Custer and Justin Allgaier would all secure stage points and Garrett Smithley would secure the free pass. The field would go back to green for the beginning of Stage 2. 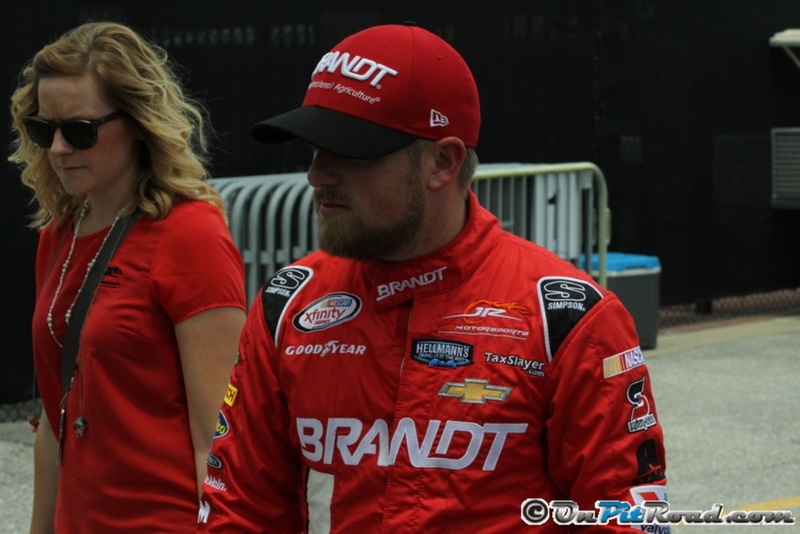 Cole Custer and Justin Allgaier would start on the front row. Custer got a push from Hamlin to take the lead but as the field entered the backstretch, Brandon Jones lost control of his No. 33 Chevy, sending the No. 96 of Ben Kennedy spinning. Michael Annett came down and hit the rear of the No. 96 sending the rear in the air just a little. 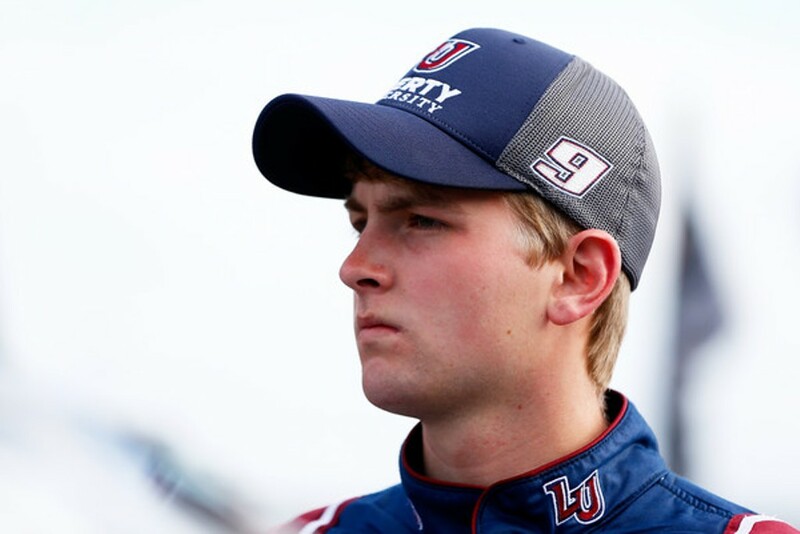 Both Kennedy and Annett’s days would be done as was J.J. Yeley who was also involved in the accident. As the field restarted once again, Custer would get a big push from Keselowski, but Sadler would also get a huge push from Hamlin setting up a two-by-two battle into the turn. Custer was able to clear the field, and take a commanding lead on the backstretch. With 12 laps to go in stage two, Keselowski would regain the lead from Custer who would begin to fall back as a result of only taking two tires under the previous yellow. A caution came out for debris in turn four with 3 laps to go in the stage. Keselowski and many others took advantage of pit road opening before passing the start/finish line. As a result of the late caution; Sadler and Brennan Poole, among others stayed on track allowing Sadler to take the victory in Stage 2 when NASCAR couldn’t allocate enough time to restart the race. The drivers who stayed out pitted at the end of Stage 2 with the exception of Sadler. Sadler would lead much of the opening parts of the final stage, but he still needed to pit earlier than those who pitted just a few laps earlier. With 43 laps to go, Sadler would get the good fortune he desperately needed as the caution would be shown for debris in turn one. Hamlin would shoot out to the lead at the restart as everyone pitted, and would lead up until debris was found in turn three with 14 laps to go. With ten laps to go, Byron pushed Keselowski to the lead on the restart before taking the lead on the backstretch with a push from Hamlin where he took a commanding lead before the caution came out with five laps to go setting up another restart. Byron restarted with the lead with less than three laps to go. 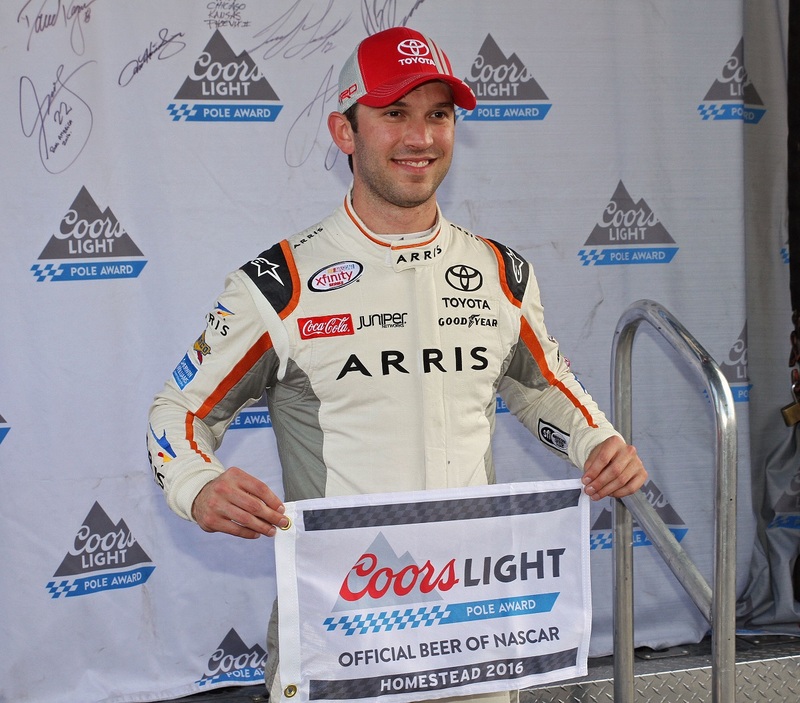 It looked as if Byron would walk off with his first career win, but as Hamlin and Byron got to the front stretch, it was a side-by-side finish with Hamlin defeating Byron by 0.012-seconds. Sadler would secure a third-place finish, regaining the points lead. Keselowski, Busch, Ty Dillon, Paul Menard, Ryan Reed, Brandon Jones, and Custer would round out the Top-10.